The Forest Governance Project, financed by the European Union, is developed in Belize, Guatemala, Honduras and Nicaragua, by a consortium of indigenous and community based organizations led by ICCO. 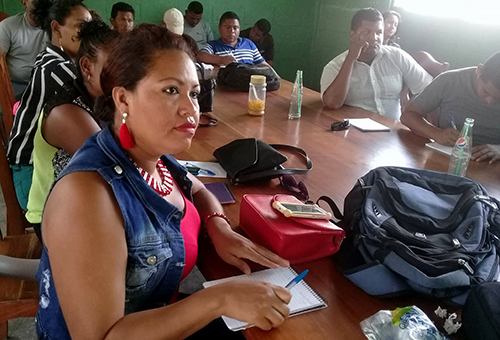 In the Nicaraguan North Caribbean, it is implemented in alliance with the Indigenous Territorial Government Twi Yahbra, to strengthen operational capacities of Miskitu forest communities and their effective involvement in forest governance and sustainable management. The Territorial Indigenous Governments (GTI, for its Spanish acronym), are the base unit of the administrative political division of indigenous territories in Nicaragua. They function according to their customs and traditions under the principle of self-determination through a regime of self-government, with the elements of: territory, language and community. One of the competencies of the Territorial Indigenous Governments is to develop and administrate plans for the use and management of forests and natural resources, in coordination with the competent regional or national institutions. In the framework of this project, GTI Twi Yahbra works with 13 Miskitu communities coordinating capacity building processes, to promote knowledge on sustainable forest management, leadership and participation.